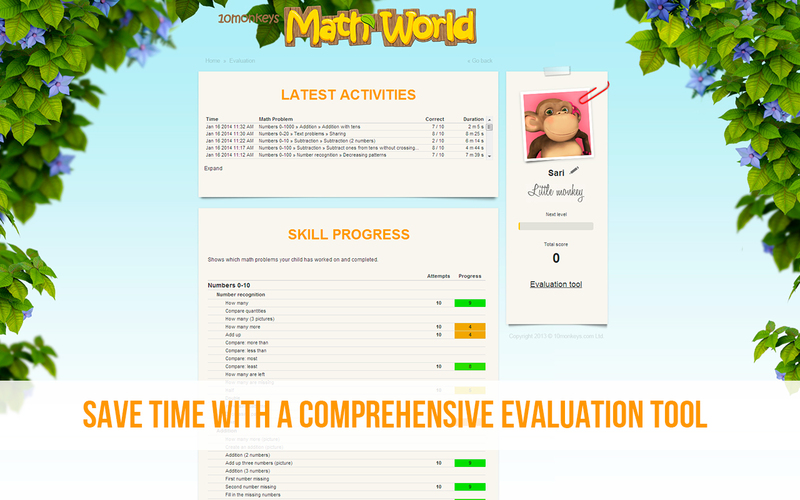 I was offered the opportunity to write a review of a math practice site called 10monkeys.com. I love technology and so do my students. They really love to do anything computer related. Yes, this website is all about math, but it makes it fun. They can win virtual prizes and the graphics are adorable. Click on the graphic below to be taken to the site. This website originated in Finland. 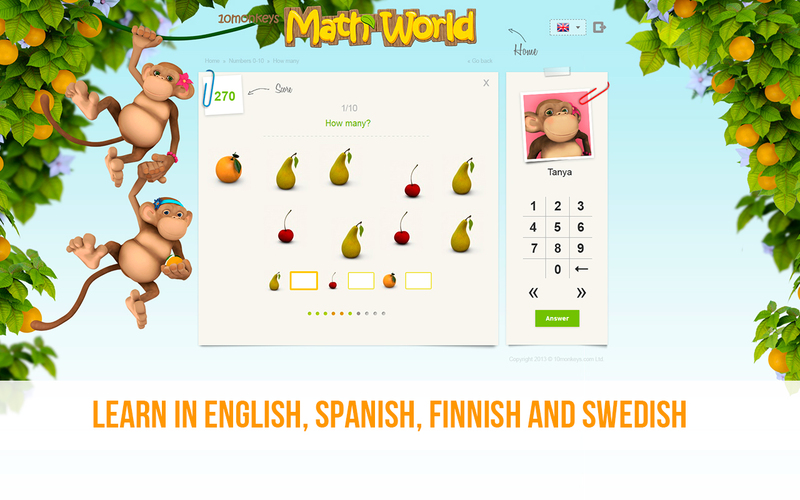 Yes, Finland…the country with the highest reading and math scores in the world. It has recently come to the US and I had the opportunity to explore it. 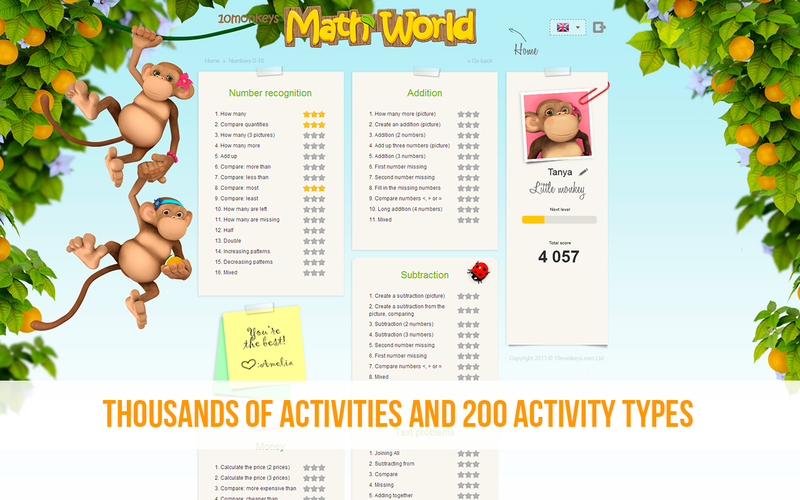 10monkeys is a great way for younger students to master the basic math facts. As a fourth grade teacher, it is so frustrating to see students who do not know their basic facts and are still counting on their fingers. Not knowing basic facts impedes the understanding of more complex math. There is no longer a need for flashcards or the “drill and kill” method. This site will help them to master those facts on their own time and at their own pace. There are many levels available for the different learners and the site is safe and ad free. There are TONS of activities based on different concepts. I could definitely see using this in class, but also assigning differentiated problems or activities for homework. As I said, the website originated in Finland, so it is available in multiple languages which are great for English Language learners. As the students complete the problems they are instantly given feedback. This is helpful for students to understand their mistakes. Their activities are tracked and recorded so that parents, students, or teachers can easily see where progress is being made. So come check out 10monkeys! There is also an app available on the app store, which practices multiplication facts in game form. Click on the monkey below to be taken to the link for the app. The site is perfect for early learners through grade 3 and the cost to register is low. It starts at $5.90 a year per child. There are group rates available. The best part about the review is that I have three one-year subscriptions to share! I will be posting the giveaway soon so make sure to check back!